In the foreground Four Wands stand firmly planted in the ground. They are positioned, two on either side, to symbolically form an entrance, door or gateway. A garland crafted out of foliage, flowers, vegetables and fruit, hangs suspended from two of the Wands. Pretty red bows hold the garland in place. In the background stands a castle or town. There is an air of prosperity around the castle. It looks elaborate, the gardens well-tended. A moat separates the castle from the outside world, suggesting privacy and exclusiveness. A bridge crosses the moat, thereby offering controlled access to those who live and work there, or have been invited as guests. Two richly dressed female figures stand in front of the castle, framed in the garlanded entrance. Their floral headpieces are in keeping with the foliage of the garland, suggesting effort in creating a look or style for the occasion. The females wave nosegays above their heads. They look joyful and exuberant in their stance. There is an air of anticipation and excitement in their wave, as if welcoming the arrival of someone special. They may have a role to play in the events that will take place at the castle. This is not their everyday attire. The females have worked hard to make sure everything is in place. In the background, we see several figures interact with each other. These may be staff attending to last minute details, setting out chairs or tables, carrying trays of refreshments and snacks. They might also be residents of the castle, or invited guests. A strong family energy permeates the imagery, a sense of blood connection and lineage. The four Wands symbolise the strength and support among family members. The imagery could suggest a family gathering, reunion or homecoming as relatives gather to catch up on each other’s lives, admire children, pay respect to elders and recall those who have passed. There is community energy, shared memories and familiarity. This is a Stage Card. The foreground is flat and uniform in colour. The background depicts a scene like a backdrop in a play. The four Wands resemble props, the figures – the actors. The castle and moat are constant, the Wands, garland, and richly dressed people may come and go, taking their turn to stage an event or occasion to their own style or taste. They may pay heavily to play Lord and Lady of the castle as they host celebrations and oversee the enjoyment of their guests. Today they have exclusive use of the castle and its grounds. This must suggest a very special and grand occasion. 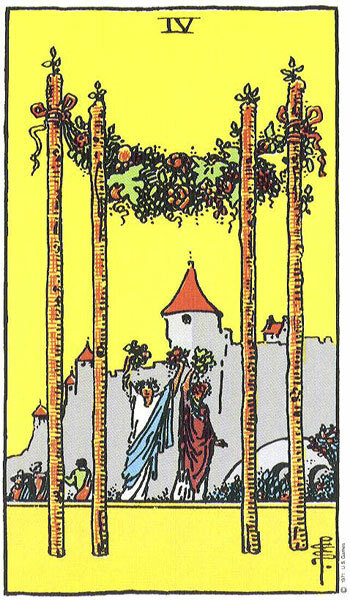 As the Four of Wands is known to be a Wedding Card, the scene ideally lends itself to such pomp and ceremony. The two female figures waving through the entrance could be awaiting the arrival of the happy couple as they make their formal entrance into the celebrations. It could also be where the ceremony is to be held. Everything is in place and ready to go. The castle implies wealth, grandeur, power and status. Those who stand on the far side of the moat in the castle grounds might live there. Their luxurious clothes, everyday attire. The figures in the background could be staff, or other family members. The females wave out to draw attention to their wonderful life. They are happy and carefree and have nothing to worry about. The intense yellow sky gives the impression of brilliant sunshine and heat. The castle and grounds might also represent a holiday location or countryside idyll. With the four Wands gracing the front of the castle, it could imply the front door of an exclusive hotel, chateau or complex. The imagery suggests expense and privilege, but that very much depends on the perception of those who live or frequent there. It may be grand and salubrious, but it could also be simple or bijou. Regardless, there is a feeling of it being the best place in the world to be. We cannot help but envy the figures in the imagery, and wish that we too could be there. Life is good and all is well. Be it stately or humble, the Four Wands planted in the ground give an impression of strength and stability. This could the front door that leads to the centre of your home, the place you feel most comfortable. The figures in the doorway wave proudly declaring that this is where they live or come from. Everything about the interior reflects their personal style and taste. The door is open suggesting a warm welcome to all visitors, but the moat and bridge remind us of the need to protect and defend that which they have built, and those that reside within. This is where their real life happens, where they rear their children, eat food together, celebrate occasions and holidays, where good times are enjoyed, and hard ones endured. No one can vouch for what goes on outside the gateway of The Four of Wands, but once inside, it is a haven of security and stability. Nothing can disturb the harmony created within. The Four Wands also symbolise laying foundations, marking your territory, claiming your space, and building upon it. There is a sense of permanence, of coming home, in the positioning of the Four Wands which stand like fortress walls. It takes great team effort, ambition and commitment to yield such magnificent results. It can suggest the family home, where your roots lie, where your personality was formed and memories created. It is a place you can always return to, visit, or escape to. Some may be born to the manor, silver spoon in mouth, entitled from birth. They do not strive to gain access to it. Luck, chance or fate may bring others to it, permitting elevation to a higher level, a golden key to a door once locked or barred. The Two Wands joined by bows, can suggest the union of those who are responsible for the occasion that is being celebrated in the imagery. Both retain their uniqueness in the single Wands that stand beside them, but their bloodlines will join in the creation of offspring, the product of their union. The roots sink deeper and firmer as the family grows and expands. This is a greater common cause than experienced in the Three, which was still formative in its presence. In the Four we find manifestation, something solid and tangible. Something that can be leaned on, relied and depended on – built upon. There is much to celebrate for the group in the imagery. They have all contributed to the success of this occasion. The garland draped across the Wands is heavy with fruit and vegetables beautifully symbolising the fruits of their labour. Their harvest is in, the time they have all being waiting for. The work is done and they can feel very proud of their achievements. The strong yellow sky in this card symbolises the bright and uplifting time been experienced by all. The abundant yellow and the orange foreground also suggests a time of great confidence, self-esteem, joy and vitality. The Four Wands stand equally balanced, appropriately representing the stability, harmony and prosperity enjoyed by all. Even the wind has cooperated with plans. Not a breeze disturbs the garland as it hangs between the two Wands. The air is calm and still. The settled weather filters through to the gathering, allowing the figures to relax and be at ease. Nothing can disturb their special day. In the Four of Wands, the season for festivals, parties and celebration has definitely arrived. This card brings freedom and liberation on all levels of being. For the time being the figures in the imagery are free to set aside the daily grind and just be. In the Three of Wands we witnessed the departure of a person after much deliberation. The figure had turned his back on his past, and bursting with enthusiasm was excited about setting off on his new venture which he hoped would change his life and fulfill all his dreams. When we left him, he was taking a moment to pause as he looked far out across the ocean to his new world before heading down to board his outbound ship. In the Four of Wands we now experience or anticipate his arrival and it looks like it is creating much excitement all round. He has been expected and much work has gone into preparing for this big day. As we enter the scene in The Four of Wands our attention is immediately drawn to two women who joyfully wave bouquets of flowers high above their heads. Both women appear to have paid particular attention to their attire on this day and even wear elaborate arrangements of flowers in their hair. In the foreground Four Wands stand adorned with garlands of fruit and vegetables. 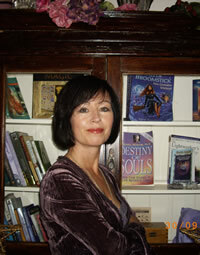 The Wands are positioned in a manner which make them look like a doorway or entrance. In the background stands a castle or town. There is an air of prosperity around the castle as it looks elaborate and the gardens well-tended. Other people are seen in the background carrying out various tasks and putting the final decorations in place. These people are all part of the same group who have gained admission through the garlanded doorway. This card brings with it a wonderful sense of belonging and the feeling of being a part of something very special. The two women seem to be focusing their attention on the doorway or entrance. They are keeping a look-out for the arrival or homecoming of a certain person. They either want to be the first to see this important individual or have been chosen by others to alert them at the appropriate time as they may wish to avail of the element of surprise. In fact the people in the background look as if they may be hiding or keeping their heads down. It looks like an important day, a day that everyone has been waiting and planning for. Outfits of clothing and hairstyles have been carefully chosen and everyone is looking their best. There is a building sense of excitement and exuberance in the air and we feel the moment of arrival cannot come soon enough. The arrival or homecoming of someone very important is imminent. Someone has a very pleasant and thrilling surprise in store for them. A warm welcome is assured and as we gaze upon the scenes in this card we find ourselves wishing the we could be there too. When the figure of the Three eventually arrives, not only will he have traveled many many miles but will also have gone through much transformation from the original spark of the Ace. He now has a strong sense of personal achievement as he moves into this very new phase of his life. While he has the support of all at present and everything looks bright shiny new, he does need to pause for a while to take stock of his surroundings. As much as the Wands love movement and travel, he is bound to want to take a rest and allow himself the time to settle into his new environment and taste his success. This will be quite stabilising for him after all the action and upheaval of the previous three cards. Note that this card is also a Stage Card. However, this time let us look at it kindly and assume that it merely implies the stage is set for a big occasion. Many people have collaborated and worked hard to get it to this stage. We will also assume that those gathered are both welcoming and supportive as the Four of Wands is a very positive card to turn up in a reading. Possibly in the reversed we may see another side to all this gaiety but for the moment let us enjoy and wave back at the two women who are trying to get our attention. Maybe, they are calling us in to join in all the festivities. They are very friendly indeed. Time to go shopping for glamorous outfits, hats and shoes for you are going somewhere special. While you are at it, book the hairdresser, nail technician and why not get your make-up done too for there is going to be some style to contend with. Weddings, parties, banquets and family or school re-unions are in the air and you just can’t wait. Maybe it is your own wedding or birthday party and you cannot contain your exuberance. Whatever occasion you are going to or involved in it is bound to have you all abuzz with excitement and anticipation. People are gathering and you will be with them for a very important occasion. A lot of effort will have gone in to ensure that this event is a major success. This big day has involved people pulling together and each giving their best as they want everyone to enjoy themselves. The appearance of The Four of Wands reassures you that you will manage to ‘pull it off’ spectacularly and it will be a splendid day for all. The Four of Wands is especially connected to family gatherings and very especially to home-comings. In the imagery of this card, the scene could be happening absolutely anywhere. If we let our imagination wander, the two women waving bouquets outside the castle could just as easily be standing outside the Arrivals Door at an airport excitedly waiting to see the familiar faces of family members home for the holidays or festive season. “I see them, I see them. Here they come” racing forwards to embrace as tears of joy and relief flow down their beaming happy faces. Then again, the two women could be awaiting the arrival of an unsuspecting mother and father who think they are just going out for a quiet dinner to celebrate their anniversary. The two women along with the other family members in the background have other plans for them as together they have been organising a surprise party for their parents for the last few months. They keep a look out at the door ready to flick the light switch on as the signal for all to scream “SURPRISE”! therefore wonderful surprises may be in the air and who knows the surprise might just be for you! When the Four of Wands appears in your reading it brings with it a great sense of joy, excitement and contentment. It indicates strongly that you are entering a very stable and prosperous period in your life. It is a time for feeling supported by all those around you. The Four of Wands is also the ‘Vacation’ card and its presence in a reading can suggest that a trip or holiday to the countryside could offer much-needed rest, relaxation and a break from the daily grind. The Wands are governed by the Fire Element so do love things hot and spicy. The colouring of this card suggests heat and glorious sunshine so maybe a vacation to a warmer climate could be on the cards for you. This holiday will give you a great sense of freedom and the opportunity to kick back, relax and enjoy yourself. You have been working very hard of late and really deserve it. A move to a new home, country, environment or workplace is often highlighted by the presence of this card and if so then it would suggest that a warm welcome awaits you there. Wherever it is you are going, be it temporary or permanent, you will find a strong supportive network of people around you. Once through the entrance gate or door you will experience a strong sense of community spirit where you will automatically be accepted. They are as excited about your arrival every bit as you are and will want to help smooth the transition for you and be eager to help. It is in the Four of Wands that you will find the kindly neighbours or welcoming committee who arrive with home-cooked apple pies and casseroles while you un-pack your possessions into your new home. The Four of Wands often suggests the new environment you are moving into is much different from the one you have just left. Everything is new, exciting and for the time-being almost holiday-like. The Four of Wands often brings with it a sense of freedom, a release from an oppressive situation or a bind you may have found yourself caught up in. When the Four of Wands appears and you are experiencing restrictions in life it carries the message that you have the power within to liberate yourself. This liberation may take place on the physical, emotional, mental or spiritual level. The positioning of the Four Wands takes the form of an entrance, doorway or gateway symbolising that if you have been trying to gain membership, admission to or acceptance by a particular organisation, club, college or establishment, it certainly augurs well for you. You should expect to receive some positive news in relation to it. When it comes to Colleges and students, the Four of Wands can symbolise Graduation Day and celebration on the completion of years of intense work and study. Well done and applause all round! Time to throw your flat board high in the air! If you are in a race of some sort or indeed involved in competitive sports, the two women waving can now represent the cheers and whoops of the spectators as you pass over the finish line (under the garland) and secure first prize. In a relationship reading the Four of Wands suggests you are settling into a relationship and feel safe and secure. A deep commitment may signify marriage and planning for engagement parties, weddings etc. This card is a strong Wedding Card and in other Tarot Decks, Wedding Couples often feature in the imagery of the Four of Wands card. Family and friends are welcoming and supportive of this alliance and excited about the upcoming celebrations. On the domestic front, this card indicates a very settled time indeed in a relationship when much effort is being put into maintaining it and building on its existing strengths. If, as a couple you have decided to set up home together, this card would suggest there is great enthusiasm and energy being put into settling in and getting to know your new neighbours and locale etc. As a couple, life is definitely on the up for you. Keep up the good work! In a career reading the four of Wands happily indicates the settling into a new job or work environment where the fellow workers are supportive and encouraging. You may have taken a job in a foreign location and are spending time establishing yourself with new work colleagues. Everything is new and exciting and you feel thrilled with the decision you made to join them. Great teamwork is indicated with everyone pitching in with his or her particular skill in order to complete a project or task. This is a happy move. The company is solid and successful. Congratulations on a job well done. The Four of Wands can suggest that you will be attending a work related function or event of importance. You may be the honorary guest or may even be looking forward to receiving an award for the successful completion of a project. A lot of excitement and prestige surrounds this event so make sure you dress well for the occasion and prepare a slick Acceptance Speech. All in all you should be happy with any decisions you made in the Two followed by the action taken in the Three as you can now reap the rewards for your effort. You are moving capably and firmly towards you goals. Enjoy your day in the sun and bask in the glory of your success. You have earned it. The Wands are uprooted from the earth and the garlands and wreaths scattered. The home front (castle) now appears neglected and unloved offering little in comfort and security. What has happened to all the initial effort and plans? Have you lost interest or maybe you are experiencing some set-backs and delays. Maybe you have bitten off more than you can chew and find the work overwhelming and have lost control. With regards to home-building and renovating, all the work being put in may not be for your personal use. Instead the reversed Four of Wands can represent the property developer who after completing the makeover then sells the property on for a profit before moving on to his next project. A transient nature is often suggested in the reversed Four of Wands. You may have a tendency to get itchy feet after period of time and need to move on. A temporary situation is often indicated where it is not possible to lay down foundations or establish roots. This card reversed can also represent the time when you leave the family home for the first time to make it on your own. It can be an exciting time but also a time of insecurity and instability as you now have to rely on yourself. It can be a time of saying goodbye to one life before moving happily into another. On the other hand it can also bring with it the empty-nest feeling when your children move out leaving you rattling around in an empty quiet house. The Reversed Four of Wands suggests insecurity and instability in your life and especially on the home front. You may be moving away from a place you know well or are being forced to sell up and go. We get a strong sense of lack of community spirit in this reversed card and you may feel that you do not fit in or that your neighbours are terrible unfriendly. You may be finding it hard to settle anywhere or to find the right home. You could have a pattern of moving home regularly. There is a strong sense of not belonging and this may be because you choose not to. You may be quite a loner, keeping to yourself and avoiding contact with neighbours or getting involved in community affairs or occasions. Maybe you just feel like an outsider who will never be accepted or perhaps you find it hard to get along with them. There may be one person in particular (a neighbour/work colleague) who makes your life a misery. You must ask yourself, who is to blame in this case for it may be your own fault. The reversed Four of Wands can suggest you are making no effort to fit in or get along. Depending on the circumstances this may suit you fine but remember we all need people around us at some time or other. If you are planning a surprise party for someone then you may not get the delighted reaction from them that you expect. Also, someone may have let the secret out and the element of surprise has gone. Your surprise may backfire on you when the person in question fails to turn up. Homecomings may have to be put on ice due to flight cancellations or unforeseen changes or plan or circumstances. When the Four of Wands reverses, holiday plans may go awry or get cancelled. The transient nature of this card may find you backpacking around the world and not staying in one place for any length of time. Bringing the Stage Card aspect in you may turn up at your foreign hotel to find that it hasn’t even been built yet or that you have a view of a building site or factory from your bedroom window instead of the sea. It certainly did not look like that in the brochures! Instead of the hot sunny weather you expected, there may be downpours and unseasonable temperatures. You may need a holiday badly but are so bogged down with work and obligations that you do not have the freedom to go. On the other hand, you may be free to take a vacation but refuse to avail of the opportunity to get away. You may lack fun and excitement in your life or feel that you never get invited anywhere. On the other hand you may be the type of person who avoids social occasions or functions of all sorts. Students may be unhappy with their achievements or grades or fail to graduate when the reversed Four of Wands appears. Remember, it all depends on the question being asked and the surrounding cards in the spread. In relationships it indicates a lack of development and depth. It was probably not built on strong foundations from the start with only one way it could go. The reversed Four of Wands can leave you feeling insecure about your relationship. A once happy home now becomes tense and less welcoming. Something unsettling has happened here which has upset this normally harmonious environment. The condition of our home or castle is often a strong indication of the condition of our relationship. If we begin to neglect one then in general we will begin to neglect the other. A sudden change in the upkeep of the family home can be a warning sign of problems within the relationship. We all start off with great intentions but sometimes it is hard to stick with them. When the Four of Wands turns up reversed, it can suggest the sheen has worn off a relationship and effort on both parts will be needed to restore it. With the lack of freedom this reversed card represents, it sometimes suggests that you are not free to marry or be involved with the partner of your choice. There are restrictions of some sort. Possibly you are awaiting your final decree of divorce or there may be cultural or religious differences that are causing blocks or objections to your plans. When it comes to weddings, the Reversed Four of Wands is loaded. Let us look at the imagery again. In the Upright we see all the excitement of everyone dressed up for a great day out. The castle looks splendid and the decorations superb. Everything is good to go and in place. Now we upturn the card and suddenly, as we let our imaginations wander we see the morning after scenario. Somewhere throughout the celebrations, the garlands either fell or were pulled down and now lie strewn on the floor. The Wands are scattered close by. A few weary guests, probably the worst for wear are still up and wandering around when they should be long in bed. The lovely hats and fascinators worn the day before look askew or are missing. The bouquets that looked so sweet and fresh now appear jaded and limp with some of the petals already turning brown. Half empty glasses are slowly being collected from the strangest of places by early morning fresh-faced but unimpressed staff. The Bride and Groom descend the stairs for breakfast, both looking a little green in the face and shell-shocked. Yesterday, the bride looked like a film star. Today, she just looks like her normal self except a little more tired. The groom looks slightly relieved that the whole circus is over and now just wants to get away for the honeymoon. The bride observes her wedding dress being taken out to a family member’s car. Yesterday, and for days prior to that it had hung from a rail preciously covered in tissue paper and protective covering. All those dress fittings she had before the big day when staff and friends were only permitted to touch it once they wore white cotton gloves. How it had sparkled and shone like a rare jewel. Today she had felt a bit bewildered and surreal as she had watched her bridesmaid bundle it up in a ball before squashing it into a black plastic bag before dumping it outside the bedroom door for collection. She had winced as she caught sight of the dirty foot prints on its train, the red wine that her drunken brother-in-law had spilled down her back and the deep orange of her fake tan that had more than likely permanently stained the underarms and fine silk. Her once-in-a-lifetime expensive purchase, which to her, had been a symbol of her hopes and dreams has now lost its glow and sheen. Her fifteen minutes of fame is up and her diva moment gone. When she walked into the reception yesterday all eyes were on her and she felt like royalty, but now as she enters the breakfast room, only a few of her guests have the energy to speak let alone look up. Every one is eager to be off and back to their own lives. As the new bride eats her breakfast she stares at her also new husband across the table and thinks to herself, what now? All the planning is over, everyone had a great day, the service and food excellent, the wine magnificent and speeches so emotional. All agreed that she had been the prettiest bride they had ever seen but now she feels a bit flat and depressed. Her big day is over and all the family and friends who especially flew home for the wedding will soon be departing. She had intended on getting around to speak to them all at the reception but there just wasn’t enough time. As she gazes out on the lawn through the expensive hotel window, she consoles herself with the thoughts of the honeymoon ahead and all those lovely presents to open when she returns. Real life and coming back down to earth again can wait until then. So after reading the above we can safely assume the Reversed Four of Wands can suggest post-wedding blues and a sense of anti-climax that often follows big occasions as such. Also, these occasions are great for getting the extended family together and it can be sad when we have to say farewell to loved ones as they board flights which will take them far, far away from us. All the planning for such days can take up our entire life and it’s not just the bride who falls into this scenario. The mother of the bride or chief bridesmaids can become instant Event Managers overnight and in some cases it can give a certain raison d’être to their lives. They become important, busy and occupied and can feel really useful. Once the big day is over so too is their role and depression and a sense of uselessness can settle in. 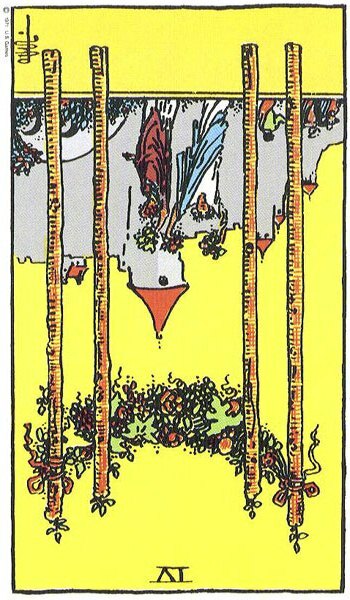 Depending on surrounding cards, the Reversed Four of Wands can suggest a wedding that ended disastrously. Someone may have been jilted at the altar or there may have been emotional outbursts at the reception or rows and family fights. The bridesmaid may have been caught in an embrace with the groom or the groom caught kissing the bride’s best friend. There may however be a bizarre story attached to the wedding such as the groom turning up at the wrong church or the bride slipping and falling into the wedding cake! Be wary of double bookings too when the reversed Four of Wands appears. This reversed card can also represent a Bridezilla, but tread carefully here if you suspect it is the querant herself. It can also suggest a wedding that is all show but has no real substance or firm foundations as the Stage Card comes into play. With the Reversed Four of Wands we can let our imagination run riot when it comes to possible scenarios for weddings but you do need to base you assumptions on the surrounding cards and not just go for what appears the most dramatic. The Reversed Four of Wands can either represent a wedding day to remember or one that everyone would prefer to forget. We must also remember that for a lot of people there may be issues within the family and this card may suggest that you are dreading the idea of an upcoming family get together or occasion. Work or career related it can suggest that you are leaving behind a secure job or work environment for something that lacks stability. Maybe you are travelling abroad on a short-term employment contract. Your job may involve considerable travelling making it impossible for you to settle anywhere. You may also be temping before something more permanent comes along. If you or your team where hoping for an award or a prize then you may lose out to the competition when the Four of Wands reverses. The whoops and screams from the crowds may be for someone else. This is not the end and rest assured you will have more battles to fight on your way to the top. Put this one down to experience and move on. The Reversed Four of Wands in a career environment often highlights a team that is not working together. Instead they pitch against each other and undermining each other’s work. Competitiveness and lack of support from your fellow workers leaves you alienated and isolated. If you have recently joined a new firm you may be experiencing difficulties fitting in. Maybe it is because you are making no effort or are intimidated by the newness of it all. Try to give it a bit more time before making any drastic decisions. Remember, there has probably being a lot of change in your life in recent times and you have worked hard to get here so hang on in there for another while. On the other hand, as there always is in the reversed cards, this reversed Four may be suggesting you are getting too friendly or chummy with your work colleagues. Often we confuse the chatter with work pals and staff night’s out as real friendships but ask yourself are these people you would choose to go on holiday with or spend your weekends with. If they are people you only meet in work then they are simply people you work with and not part of your circle of friends. This may sound quite a strange comment to make but if we set no boundaries in the workplace it becomes quite awkward and difficult when someone has to be taken to task over their work or behaviour. Not wanting to hurt anyone’s feelings we can let things slide and let poor work go by without any comment whatsoever. If you have traveled far from home or emigrated in search of work, you may be going through a period of homesickness and this is perfectly natural (look for the Three or Six of Cups especially). The excitement of the holiday period has worn off and you may be feeling down and lonely. Everything is strange and unfamiliar to you at present. You may regret the decision made in the Two and the action taken in the Three. You need to go back to the Upright Three to reconnect with that bright burning spark of adventure and ambition that has brought you to where you are now. The Freedom and liberation of the Upright Four vanishes and in its place you can feel trapped and limited in a boring job or career. You may be full of bright ideas and ambitions but no one wants to know. Every effort you make is either blocked by your colleagues or dismissed by your boss. It may take some effort on your part to free yourself from this situation but it is essential that you do. Otherwise your self-esteem and creative impulse will dry up. You really are neither happy where you are nor doing what you are doing so go and do something about it. The uprooted Wands in the Four can suggest a company that was once solid and successful but may now be facing financial instability and insecurity. Redundancies or salary cuts may follow. 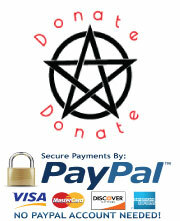 ** So, when we join the Wands again in Card V they will be half-way through their journey of the Minor Arcana. Do you think they will still be settling in and stabilising or will they be once again in search of excitement and adventure? Will they be happy to stay where they are and settle down or will they want more out of life?